Please let me know if you have any Austro-Hungarian edged weapons for sale. I have a prussian artillery saber for sale, good shape and a flawless field sharpened edge. 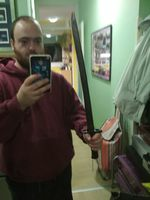 Just some pitting on it.comes with worn scabbard if you are interested. I'm pretty sure they doled these out to their allies quite a bit too. Currently I am only focused on Austro-Hungarian edged weapons. Thank you for the offer. Are you interested in M1861 infantry officer? Still looking to buy Austro-Hungarian edged weapons! 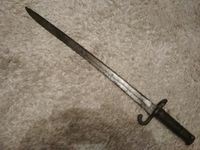 I have a post war (WW 1) Hungarian Gendarmerie bayonet for the Steyr M 95. 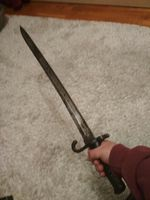 Not a common bayonet. Sorry post WW1 Hungarian is not really my area. Thank you for the offer. M1873 yathagan bayonet? Solid, nothing loose, even slightly sharp. Formidable shotsword. I am good on bayonets at the moment. 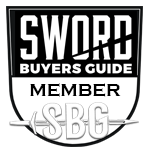 I am always looking for nice sabers (cavalry, infantry, navy, civil, etc.) preferably military proofed and/or unit marked.